Loving Lord, thank You for all my brothers and sisters in Christ Jesus our Lord, and thank You that You have made us one in Him and are building us into a spiritual temple of living stones, each with our own peculiar function, in the heavenly kingdom of God. Instill in each of our hearts an increasing thirst after holiness and righteousness, and give us an ever-deepening love for each other and for You. Keep us we pray from petty arguments and careless words and may we minister to one another in true Christian fellowship and godly love.. and in a body-ministry that exults You, where the gifts and talents of each member are used and valued in the edification of the others - to the praise of Your holy name. Draw me deeper into fellowship with You, Father. Lead me to focus on worship so that I can then, as a result, be useful in service. How amazing is Your plan of redemption, Lord, that through finding Christ we find You. Let me know Him more, that I may enter into fellowship with You. Thank You, Father, for the miracle of the cross, the marvelous bridge that allows me to have fellowship with You. Thank You Father that I am Your child. Thank You that I am positioned in Christ by grace through faith in Him. And thank You Father, for placing all those who have trusted Christ as Savior into union with our Lord Jesus Christ, and made us brothers and sisters in Him. Thank You that we are members of His Body and are being built up together as Your holy dwelling place. Thank You Lord that You have called us into fellowship with Yourself and with Your Son, our Savior Jesus Christ. Help me to make my time alone with You the most important priorities of my life. Lord, I want to know You more, that I might enter into lasting fellowship with You. May that be my deep desire and not just a topic for spiritual discussion. Heavenly Father, You have placed eternity in the heart of man. You have put a desire within our spirit for holiness and righteousness and You have developed a thirst, deep within our being for a more intimate fellowship with the true and living God. What a privilege, Lord, to fellowship with the God of the universe. Slow me down today, that I might know this intimate inner fellowship. Heavenly Father in a world that is increasingly hostile to Christians, we pray that You would do a work in the heart and lives of each member of Your Body. Give us wisdom and strength as we face this time of increasing aggression. 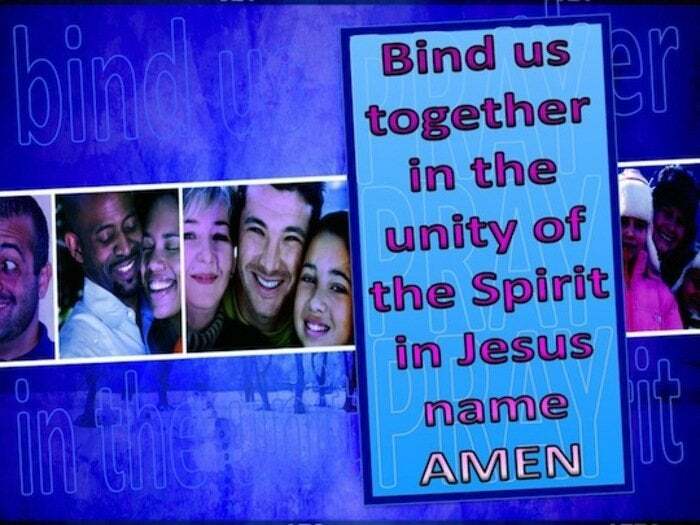 Knit us together in love and fellowship we pray, and release into our hearts a deep desire to lift up our brothers and sisters in Christ, in intercession and prayer. Lord, may I settle for nothing less than the best when it comes to my relationship with You. Give me a wholehearted thirst for You, that I may partake of the incredible privilege of intimate fellowship with You. Amen.